I had a dream the other night, (or nightmare), that I ran out of colored ink in the middle of printing. THAT IS HOW MUCH SCHOOL IS ON MY MIND! Who said that teachers have it easy and don't do any work in the summer? I feel like that's all I've been doing. Last night I spent 3 hours laminating and cutting 100 sheets. In service starts tomorrow for me. I've been doing a few things at home so that I can set them up in my classroom ASAP. I also organized my 15 bags of stuff I bought over the summer for the students and classroom. Now I have to figure out how to use it all! When you buy so much, you forget what you've already bought. Here's a breakdown of my weekend. I made schedule cards that were tailored to my school. Since it is a private religious school, we have a few different subjects that aren't on the schedule cards I saw on TPT, so I decided to make them. I made two versions - one where you can fill in the timings, and one without. I am going to use the ones without because my schedule fluctuates. 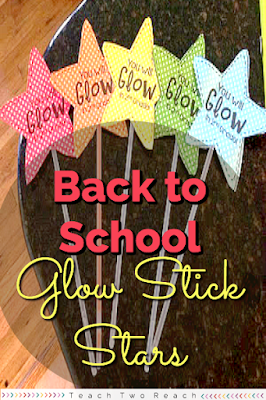 As for students, they are going to get these cute glow sticks attached to a star that says, "You will glow in second grade." 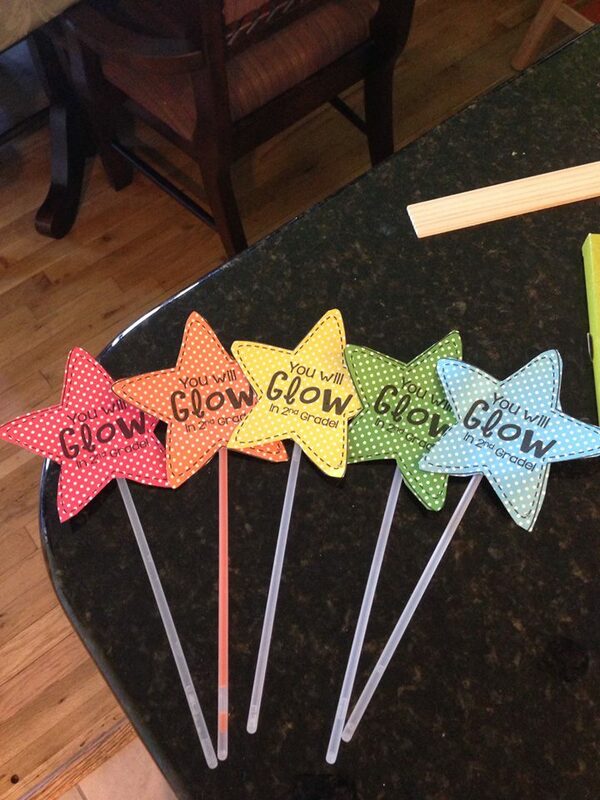 The star templates are from the Bubbly Blond Teacher. I forget how I got them because I'm not sure if they are in her TPT store, so it might have been a freebie at one point on her face book page. Anyway they are super duper cute! I did have a few casualties as I was taping the stick to the back of the star. I bent a few by accident, so they cracked and lit up. Thank goodness I had just enough to still make enough for all my students. 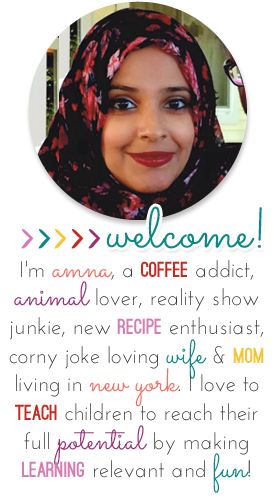 I printed the templates on polka dot card stock btw. 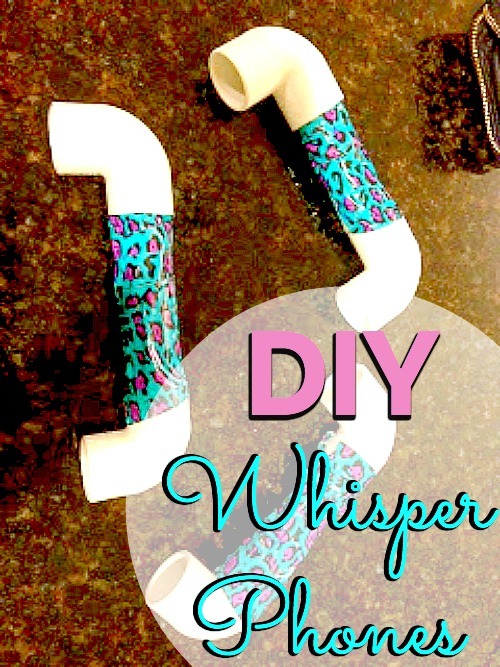 Another thing I was able to accomplish was finishing off my whisper phones. Initially I was only going to make about 6 or so. 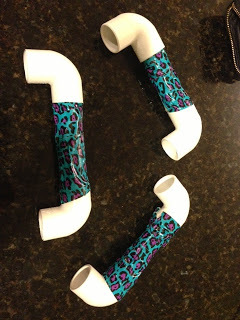 But then I had so much PVC pipe left over, that I cut it all and got more elbow pieces to make the rest. This way I was able to make about 30! So any student in the class can use it at any time when they are reading, if they so desire. You can see how I made them HERE. While I was over at Home Depot getting the rest of the elbow pieces to fit the whisper phones, I saw paint stirrer sticks. I had remembered that I saw a few teachers use them to attach a name or number on the end and use them as library book place holders so that kids can remember where to return the book. I asked the man who worked in the paint section, (verrrrrry nicely), if he could spare a bunch of paint sticks. He asked what's a bunch? I was hesitant to say 27 because that seems so many! So I just said 20...lol. I figured I could get the rest another day. But he was super nice, grabbed a huge handful, (probably around 30 something), and dropped them in my cart! Very excited to use these! Phew! This was all done in the last 3 days. Now that I've written it all out, that's quite a lot, considering I had a clingy baby who had just gotten over the flu, hanging on me most of the day. You get very efficient at laminating with one hand and holding a baby with the other when you've had enough practice. Since I started teaching 7 years ago, using a "Friday Folder," system has been a consistent organization tactic that's really worked for me. I don't like sending home graded work or projects during the week in students' regular homework folders. I like to reserve those for homework like reading logs, and notices from myself or the office. Instead, I keep the graded work and other projects until Friday. Another must in the classroom is a mailbox slot system. It helps with passing out notes or papers that go home everyday, and it is also where I put together all the work for the Friday folders. Everyone has a red folder which I label. On Friday mornings before school starts, (or Thursday after dismissal), I put everyones' work in their mailbox slots. After it is all separated, I put my weekly newsletter on top, and then put each student's pile into their Friday folder. I put the folder back in their mailbox slot. When they are packing up for the day, they take them home. Also inside the folder, I staple a list that I type up which has the dates for every Friday of the school year and a spot next to it for a parent's signature. This helps with accountability. After they empty it over the weekend, they have to sign it as well. Now, a few things come back with the folder. I develop a routine where parents know that chapter or unit tests have to come back signed and returned but mostly everything else stays home. Some parents get it right away and for some I have to send a note with the work that should have been left at home, so they know next time they should keep that kind of stuff and not send it back. Another great thing is that of course there are those kids whose parents forget to check the backpacks over the weekend and the folder comes back full. Right away I know that the parent didn't look through the stuff, and I can contact them or keep a checklist for myself to help me know who needs more assistance at getting organized at home. If papers just go erratically throughout the week, it's hard to tell who took out what and who saw what. 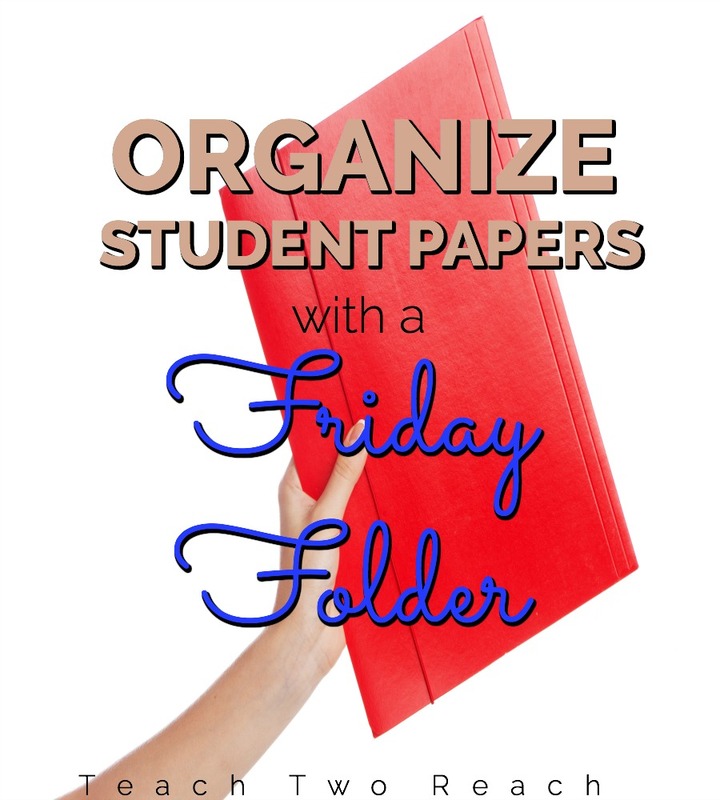 This method has helped keep the paper clutter down, regular homework folders pretty neat and clean, and has cut down stress in trying to get things graded everyday ASAP to send home for the day! I am having way too much fun with my new MAC Pro computer! It's kind of bitter sweet. A few weeks ago, my baby threw a mechanical toy onto my laptop as I was using it. It hit right below the keys. and I guess it was just the perfect spot because a ticking noise started right away. The computer shut down and I was not a happy camper but figured someone could get my info off the hard drive. You can get them for free at my TPT store. But the project that took me a real long time was making these subject buntings for bulletin boards. 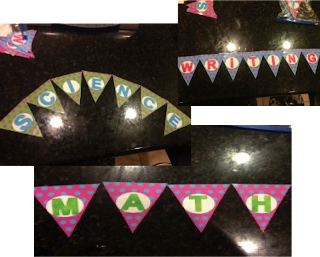 Included are buntings/banners for 5 subject areas: MATH, SCIENCE, SOCIAL STUDIES, READING, AND WRITING. You can hang these straight onto the bulletin board in any direction you would like. 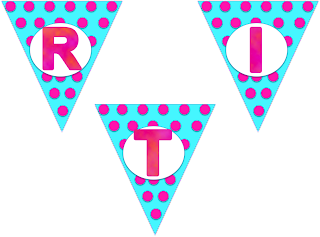 Or you can make it look like a real bunting/banner by attaching them onto a string and hanging them across the board. These are perfect for those smaller size boards or just to hang something on the side. Laminate them for durability. You can save yourself the headache of buying all those bulletin board letters and as you are hanging up the words, you realize you don't have enough of the letters you need! That is the worst. And then because you are too lazy to go buy some more, you mismatch them. Anyone out there like me? 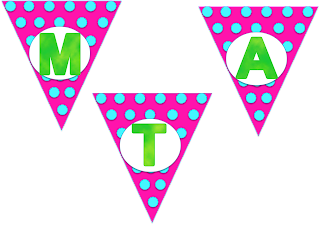 So now with these, you just have the subjects ready for you in a cute pink, blue, and green polka dot theme. Are there any subject titles you would like me to add? Want a fun, easy, and affordable way to engage students while they are silent reading, and at the same time help the issue of those students who always read out loud so they can hear themselves? What these little gadgets do is create a passageway for the students' voice to travel. They can read very very quietly (whisper), but they will be able to hear themselves through the "phone." Here's what you need and everything can be found at Home Depot or any home improvement store. - A 3/4 INCH PVC Pipe (This is a really long pipe for just a couple bucks). One pipe can make approximately 25-30 phones. - 3/4 INCH Elbow pieces for the pipe. You need two per phone and each is about 45 cents. - Duck Tape to make it look pretty! 1) Use the pipe cutter to cut the pipe into approx. 3 inch long pieces. 2) Connect an elbow on each end of the cut pipe. 3) Wrap the middle with duck tape. So yea! There are your handy dandy whisper phones. Kids will love them and if they can hear themselves read, but not bother those around them, they can improve on their accuracy and fluency as readers! So I feel like I'm a first year teacher again even though I've been teaching for seven years. And it's all these amazing teacher bloggers' fault! They have set up these incredible blogs and supplement what they do there with their Facebook and Instagram pictures. How in the world these teachers have the time to update everything AND create custom products for Teachers Pay Teachers is beyond me. That's a goal of mine though; to learn how to create products to sell on TPT. Anyway, so I've been following dozens of teachers online and it has inspired me to be a better teacher. I have all these new ideas (stolen from other teachers of course). I see the classroom creations they come up with, and I think, "I can do that too!" Most of the time I can't but it hypes me up at the moment. I've been downloading tons of resources this summer. Most of the stuff that you used to have to buy at teacher supply stores can now just be downloaded and used in the classroom. The one catch is though that if you want it to last, you have to laminate it. That's where the title of this blog comes in. I bought a Scotch laminator from Amazon and it is my new baby. Seriously, the feeling of happiness that washes over me after I see the end result of my laminating is kind of scary. I've shown it off to everyone in my family. It was super cheap too. I think it was under 30 dollars. You have to buy the pouches separately, but Amazon has a good deal on those as well. I've dedicated my first blog post to this essential machine. That's how much I love it. What did I do before it? Oh yea, buy things over again because they were ruined by the end of the year. No more of that folks!